The Indonesian island of Bali is a renowned destination, drawing in travelers from all over the globe. With its iconic landscapes, beautiful beaches, yoga and meditation retreats, cultural treasures, and idyllic resorts, Bali offers a wide range of vacation options, no matter whether you're looking to experience it all or just relax at a beachfront luxury resort. You'll find the Ngurah Rai International Airport (DPS), which is the main hub for international flights coming to Bali, 13 km south of Denpasar. Carriers like Garuda Indonesia, Singapore Airlines, Emirates, KLM, Cathay Pacific, and EVA Air are some of the airlines that have scheduled flights. If you're coming to Bali from the nearby island of Java, you can take a ferry from Ketapang. There is no real need to reserve ahead of time, just come to the dock and pay for the next boat. If you haven't been to Bali before, the traffic may seem a little overwhelming. If you are planning to rent a vehicle, you will want to familiarize yourself with how traffic and driving in Bali works. Southeast Asia in general is chaotic to say the least, and learning to drive on the left side of the road can be a challenge in itself. 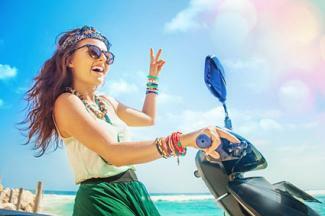 If you want to rent a vehicle, you can opt for a scooter, motorcycle or car. You'll need an international drivers license to a car vehicle in Bali, and while you technically may not need one to rent a scooter, it's better to have it anyway. If you're staying in Bali for 30 days on a tourist visa or longer on a work visa, you can look into obtaining an Indonesian drivers' license, commonly known as a SIM. Motorcycles and Scooters: Motorcycles and scooters are common ways to get around the island, but they aren't for the faint of heart. Accidents are a very common occurrence. Bali Bike Rental is a good option to search for motorcycle and scooter rentals if you go this route. 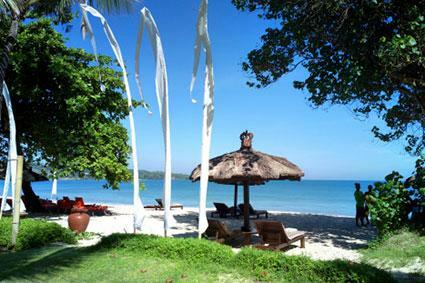 Car rental: If you want to rent a car, you'll find a number of rental car agencies on Bali. You can pick up and drop off your vehicle at the airport for maximum convenience. Metered taxis and public shuttle buses operate around Bali as well. If you opt for a taxi, look for metered vehicles or make an arrangement and agree on a price to hire a taxi for the day. Many high-end hotels have private hotel shuttles that will pick you up from the airport and bring you to the resort. Check with your hotel before arrival. The St. Regis Bali Resort is located in the secluded Nusa Dua area of southern Bali. Enjoy a variety of elegant foods or book a round of golf next door. 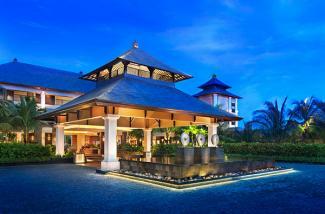 If you're looking for a nice luxury resort in Seminyak, the W Retreat & Spa Bali Seminyak. It's located at the center of the action, near hip restaurants, boutiques, and nightspots. Viceroy Bali is near Ubud and offers a luxurious retreat away from the busy beaches and center of town. You can even arrive in style by helicopter directly from the airport. Book a holistic spa treatment at the Lembah Spa, or just relax in your villa marveling at the river gorge and terraced rice paddies. Bali is home to a number of attractions and locations that are worth exploring. Uluwatu Temple is a Hindu Temple located in the southern part of the island in Pecatu Village. It was built on the edge of a 70-meter-high cliff that projects into the sea. Watch out for the monkeys here, as they are notorious for stealing visitors' belongings. The Tanah Lot Temple is one of the iconic temples in Bali. You'll also find some incredible sunsets off the Tanah Lot Sunset Terrace. Kuta Beach is one of the most famous tourist areas in Bali, especially with budget travelers and backpackers. You'll find a variety of bars, clubs, souvenir shops, and lots of traffic. You have options to partake in a number of watersports here, including surfing. Ubud is typically referred to as the cultural center of Bali. It's quite tranquil as compared to Kuta. 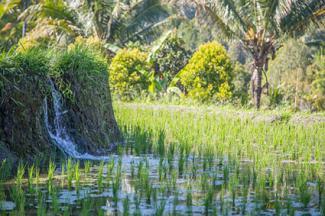 Don't miss the nearby rice paddies, one of the most photographed spots in Bali. The traditional village and panoramic views are not to be missed, including the cave at Goa Gajah. The Rock Bar at Ayana Resort sits on a secluded limestone cliff, offering an amazing locale to grab a drink. Enjoy one of Bali's iconic sunsets with a signature cocktail in hand for an unforgettable experience. The Gili Islands, or Gilis, are three atolls off the coast of Lombok, the islands feature world-class diving, a turtle hatchery, and even an Irish Bar and Japanese sushi restaurant. A range of lodging options and dive liveaboards (diving vessels with onboard guest accommodations) are available. Whether you want to stick to local Indonesian eats or dine in a five star resort, you'll find a wide range of food in Bali. Food stalls are called warungs and these are where you'll find the cheapest eats. Restaurants often stay open as late as 11 p.m. and the international cuisine available is quite varied. Enjoy Spanish tapas one night or Russian Borscht the next. Shopping is quite the pastime in Bali, and travelers will find no shortage of options. Lonely Planet has a great round up of shopping in Bali, including some helpful tips. Expect that you will find everything from tourist trinkets and souvenirs to high-end luxury malls in Bali. Bali is south of the Equator, has a tropical and humid climate, and is subject to the Pacific typhoon season. Basically, there is a dry season and rainy season in Bali. Peak tourist season is July and August, Easter holidays and Christmas/New Year. Bali.com says the best times to visit, however, are April, May, June, and September which are just before and after peak season. It's still dry during these times and prices can be up to 50% cheaper. If it's your first time visiting Indonesia, you'll want to keep a few helpful tips in mind. Depending on the country of your passport, you'll need to verify visa requirements. For U.S. citizens, Indonesia issues a visa on arrival for a fee. Ensure there is at least six months left before expiration on your current passport. Dress moderately when entering a temple. You should cover your shoulders, upper arms, and knees. If you're a smoker, pay attention to where smoking is allowed, as smoking is not allowed in many public places. Check-in and check-out are typically not allowed on Nyepi Day, or Day of Silence. The airport also closes for the day. Whether you're looking for a tranquil retreat, a family vacation, or an adventurous experience, Bali offers up something for everyone. Enjoy your time in this exotic paradise!